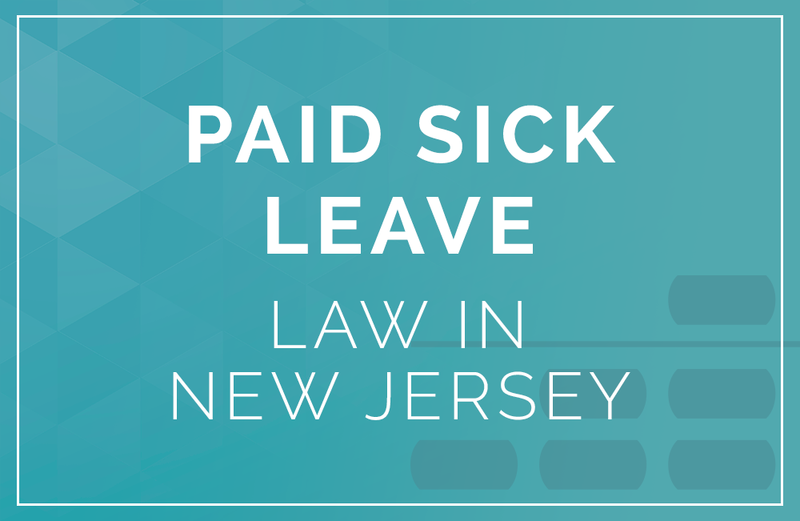 In May 2018, New Jersey became the tenth state to mandate paid sick leave, expanding earned paid time off to cover nearly 1.2 million employees within the private sector. As an employer in New Jersey, you’re probably aware of the major components of the bill signed by Governor Murphy, the short version being that paid sick time off is now mandatory for qualifying businesses throughout the state. However, you might have missed several key elements of the bill which may alter how your organization approaches sick leave going forward. To help you stay compliant, following is what you need to know about New Jersey’s paid sick leave changes. When the bill goes into effect in late October of 2018, employees in most career fields will begin accruing one hour of paid sick leave for every 30 hours of work time, with a maximum total of 40 earnable hours. Note that applicable family members include children, grandchildren, sibling, spouse/civil union partner, parent, grandparent, spouse’s siblings and/or parents, or any blood relative. Parents can be biological, adoptive, foster, step parent, or legal guardianship. Non-eligible employees include some construction workers, per diem healthcare employees, and employees covered under a collective bargaining agreement, but even temporary workers fit the “employee” description and thus qualify for the same paid sick leave as everyone else. While you should double-check to make sure that this bill applies to your business, it almost undoubtedly does. At the end of the benefit year, employees can choose between carrying over their sick leave (a maximum of 40 hours) to the next benefit year or receiving a payout. This choice is completely up to them; avoid offering incentives or attempting to influence their respective decisions one way or the other. This means that, as an employer, you’ll need to work with your HR team to come up with a 12-month benefit year plan; furthermore, you won’t be able to deviate from the plan without running it by the Commissioner of Labor and Workforce Development. It’s worth pointing out that you can simply grant each of your employees 40 hours of paid leave per benefit year, but doing so requires any other pay and benefits employees would usually accrue to transfer during paid time off as well. Giving employees sick leave up-front has generally produced positive mental health benefits; however, check with your HR team to see how doing so might affect record-keeping. First and foremost, know that this paid sick leave mandate is required for employers of all sizes. There are no exceptions for smaller businesses with a certain number of employees. New Jersey previously had 13 towns or municipalities with their own paid leave ordinances, which this mandate now trumps. New Jersey employers should familiarize themselves with the full requirements of the 2018 law, in addition to meeting any FMLA conditions. Businesses with existing paid leave policies or PTO banks that satisfy the requirements of the new law are exempt. Employers are able to enforce blackout dates, so you have some say in when and where foreseeable sick leave gets used. For example, if one of your employees requests a specific day off for an appointment, you can veto the request; similarly, if an employee takes a day which was previously off-limits, you can legally require some form of documentation (e.g., a prescription) to ensure that they used their sick leave as described. If the employee takes more than three consecutive days of sick leave, you may also request documentation. This is especially important for companies with a seasonal businesses model. You can also ask that your employees give you up to seven days’ notice for foreseeable sick leave, though asking for more advance notice than that goes against the bill. The sick leave increments themselves are up to you, within reason: while you can determine the length of sick leave that employees can take (e.g., eight-hour increments), you can’t make sick leave accessible only under certain conditions, and you can’t extend the amount of sick leave used to go past the number of hours an employee would usually work. Keep in mind that, while your employees by default can’t start using their paid sick leave until 120 calendar days after starting work with you, your employment agreement can state otherwise if you want your employees to be able to use their sick leave sooner rather than later. You cannot extend the amount of time which must pass before employees can use sick leave. An important part of the bill to be vigilant about is that employers are prohibited from discriminating or taking adverse or retaliatory action against employees who request or use earned paid leave. This includes demotion, suspension, refusing a promotion, reduction of hours, unfavorable assignments, or denial of any right guaranteed under this act. Ultimately, the take-away for you and your employees is that sick leave is a mandatory benefit come Fall; you have 180 days from the bill’s pass date to determine whether your policy is compliant. Evaluate your current HR plan and vacation and time-off policies and compare them to the requirements of the new law. Amend accordingly. If you do not offer paid leave, compose and communicate a new policy before October. Information on New Jersey’s paid sick leave law must be posted in the workforce and communicated clearly to your employees. Talk to your payroll specialist or HR department to make sure you have an accurate PTO tracking system in place. To minimize litigation risk and exposure, ensure all management and supervisory personnel are aware of what is prohibited when it comes to the new law, including denying compliant requests and taking retaliatory actions. It is also recommended to update your Employee Handbook to reflect your new or amended PTO policies, how you will address unused sick leave upon termination, and clearly state the employees’ rights when it comes to NJ paid sick leave. If you don’t have an in-house HR professional or team, consider Abacus Payroll’s HR Help Center, which can help you stay informed and compliant with the latest information, sample memos and policies, Q&As, and more labor law information to help protect your business. Legislature compliance can be a nightmare to nail down, and having a six-month time constraint doesn’t help. If you’re worried about staying compliant, Abacus Payroll is happy to offer on-demand assistance via our HR help center; whether you’re interested in hiring our HR services or you just want more information on how New Jersey’s paid sick leave law affects you, give us a call at (856) 667-6225 today.